The old graveyard in Norwichtown, Connecticut is a little tricky to find. It's tucked in behind the main roads and is not readily visible from the street, so you have to know where it is in order to find it. Norwichtown is the old section of Norwich, Connecticut, notable for historic sites such as the Leffingwell House Museum and the grave of Samuel Huntington. Most people who recognize Huntington's name at all know him as a signer of the Declaration of Independence, but there are a few dogged Norwich residents who insist on calling him the first president of the United States. "Old Cemetery Lane" is a tiny alley with a dead end sign. It's easier to find the graveyard by looking for the McDonald's. 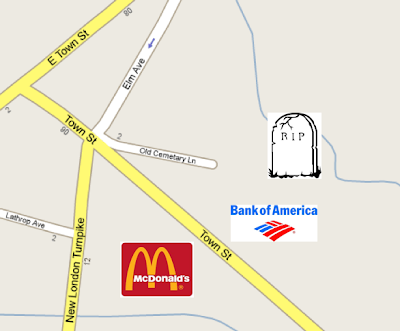 There's a bank across the street from the McDonald's — you can park in the bank parking lot and go (carefully) over the stone wall into the graveyard. If you do find Old Cemetery Lane, there is a parking area and a wooden box with walking tour brochures just outside the gate. There are also oodles of other Huntingtons, as well as Backuses, Lathrops, and other prominent Norwich families. 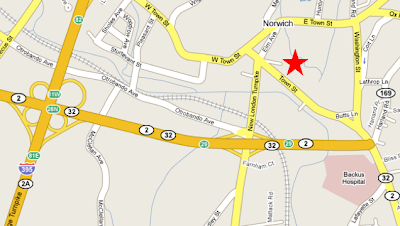 If you decide to visit the Norwichtown graveyard, bring water and insect repellent. Most of the graves are in a hollow near a stream, and it is both muggy and buggy.